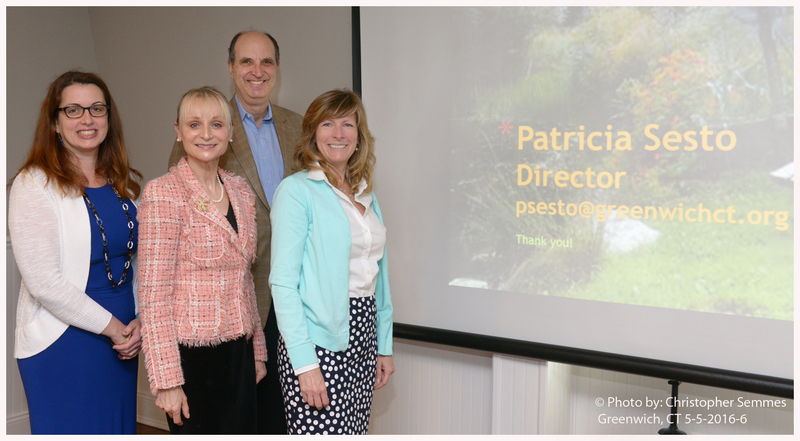 This week at our Chamber of Commerce Government and Community Affairs Program series, we met with Town of Greenwich Inland Wetlands and Watercourses Director Patricia Sesto. Since Pat started as the Town of Greenwich, Inland Wetlands & Watercourses Director, she has implemented many welcome changes. She highlighted that her goal is to provide customer service while protecting and improving the environment. Pat shared with us the many benefits of conserving our wetlands and watercourses and her consistent and consultative approach to current regulations. The Chamber’s 2015 Survey of Business Attitudes revealed that Chamber members’ areas of most concern were: Inland Wetlands and Watercourses, Planning and Zoning, Parking and the future of Connecticut’s business industry. Greenwich Chamber of Commerce Government and Community Affairs Committee promotes its advocacy efforts by connecting business people and residents with Town Hall. Please join us June 16th for our next event in this series with Director of Parking Services, Rita Azrelyant. Click here to register and for more information.